Acclaimed author Sam Quinones—the best-ever writer about modern-day Mexican migration—had one hell of a 2016. His book, Dreamland: The True Tale of America's Opiate Epidemic won a National Book Critics Circle award for general non-fiction, and should've been nominated for a goddamn Pulitzer. He's toured all around the country to talk about his masterpiece, especially areas like the Rust Belt and smalltown America that usually doesn't get big-name authors to bother with them. And now he's ending his 2016 this Sunday at the Bowers Museum with the release of a passion project of his: The Virgin of the American Dream, a book of murals of the Virgin of Guadalupe used by business owners to dissuade people from tagging their walls. Sam has been taking such photos for over a decade, and combines his ever-sharp eye with ever-smart pen to offer an instant classic. He'll offer a lecture at the Bowers at 1:30, and books will be for sale. Tickets are $9 for members, $12 for general. GO GO GO and BUY BUY BUY! And, in the meanwhile, Sam took time to answer some questions. OC Weekly: When did you first get the inspiration for this project? I’m not Catholic. But living in Mexico (1994-2004), I could see how important La Jefa was for poor and vulnerable people. How she softened what could be pretty cold and hard circumstances. I felt drawn to her for that. I spent my first real Dec. 12 with gang members from Zamora, Michoacan, and we went down to the cathedral and they walked on their knees across the plaza to the altar. On the streets where they lived her altars were everywhere. I could see then that these folks found really very little refuge in church, very little softness and succor. They found that instead in her. That stuck with me. In time, part of my heart was given over to her, as I saw how she helped poor people. I learned more about her. She appeared to Indians, conquered by the Spaniards, as a way of helping navigate their new reality. Years later, now I was living in LA, I began to see how the Virgin, translated to Los Angeles, was used for a similar reason by immigrants, helping them navigate a new world. I was struck too by how many folks used her as protection, as a security guard for the modest investments they had in their mom-and-pop markets or flower shops or muffler shops. That was the spark for the project. I’ve lost count, but I’d bet I have more than a hundred murals shot – and many more to go. 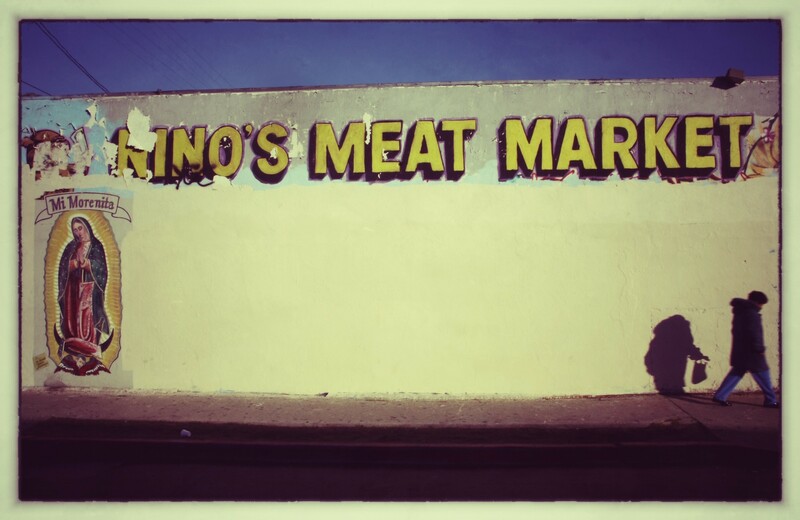 She’s everywhere in East LA and South Central, one of the most important images in the landscape of those areas, and probably in all of Southern California. 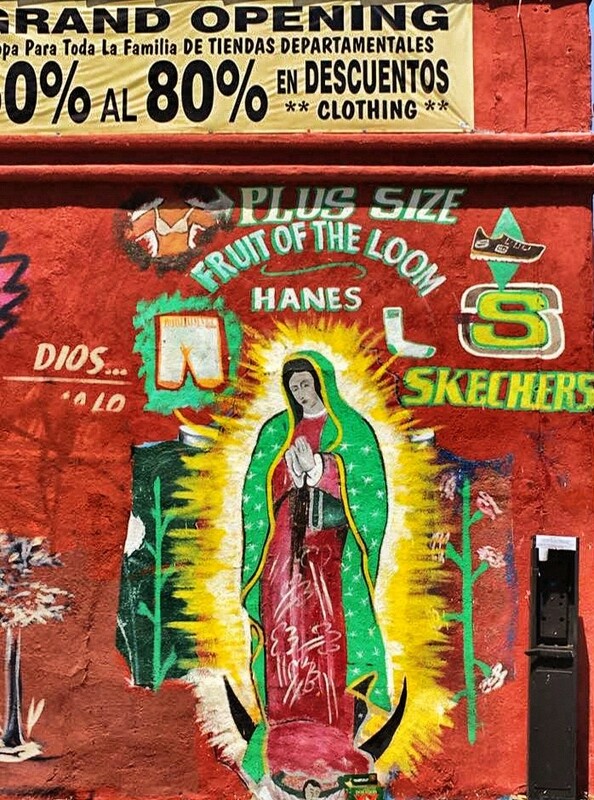 *What are some of the more unique guadalupana murals you have seen? Usually it has to do with juxtaposition. 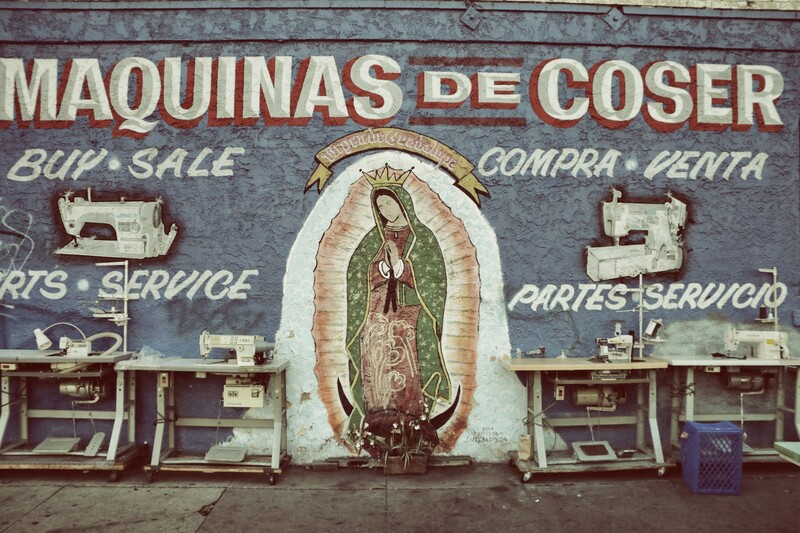 One Virgin protects a Dorito’s sign, another a Fruit of the Loom painting, a third a “Maquinas de Coser” sign. She protects pictures of milk, detergent, corn, fruit, and cold beer, as well as Marlene’s Discount and Mariscos Guadalajara. I’m also struck by how some murals portray her as kind and soft. Others not so much. I love too how she comes out on different surfaces – stucco, concrete block, wood. She’s at home on all that. *Generally speaking, how effective are those murals in protecting their home walls from graffiti? Is there a stigma in the tagging/gang community for defacing Her? Pretty effective for a long time, though I’ve noticed that taggers today don’t have anywhere near the same respect for her that did gangmembers years ago. Maybe the gangsters are also changing. But for years, she really kept the gang graffiti away. What interesting is that it’s not just Mexican-immigrant merchants who put her up. I met a man from India who had his market walls painted with her image. He told me he did so for just that reason – to protect them from graffiti. 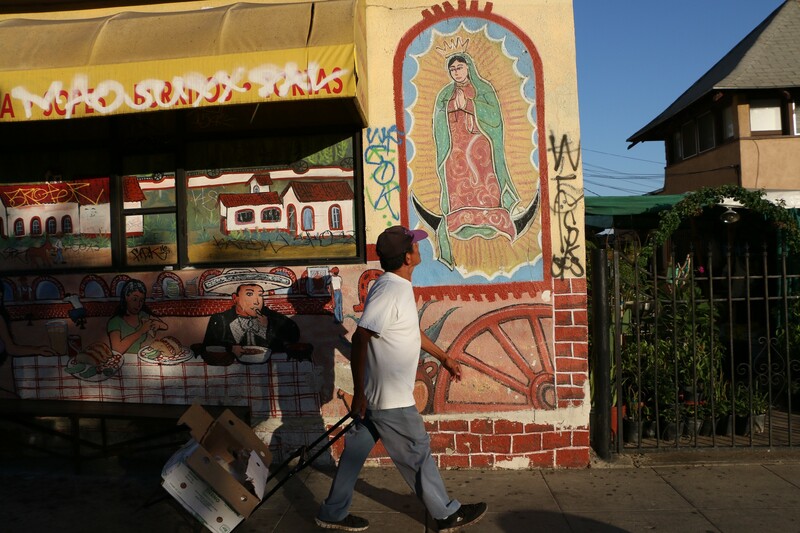 *Is there any other patron saint you've seen on murals as ubiquitous as Guadalupe? No, nothing. Jesus is here and there, but nothing compares to the Virgin of Guadalupe. *What can people who attend your lecture at the Bowers expect? I’ll be talking about my own relationship to La Jefa, as a non-Catholic, but mostly I’ll be showing slides of murals, and talking about the trek she’s taken, along with so many immigrants, from her home in villages in Mexico to carving out a place for herself, a home, on streets of Southern California named Hooper, Compton, Whittier and Mozart. *On a separate note: you had one hell of a 2016 with Dreamland. Did you expect such a warm reception to the book? Also, do you think our country's pill epidemic will get better or worse? I was hardly expecting it at all. When I was writing the book, though I could see it was a big issue and growing bigger, no one involved wanted to talk about – parents primarily. They were ashamed of their kids’ addictions, or how they died. They remained silent, cloistered in their houses and their grief. Today, we have more heroin-related deaths than gun homicides – that was true in 2015, according to the CDC’s recent figures. I believe it’s continuing to get bad, and our awareness of it now allows us to recognize how bad it actually is. It may be a while before things improve, I hate to say. *Finally: Who's your patron saint? Dec 13 is my birthday and the saints for that day are pretty obscure. St Autbert? St Einhildis & Roswinda? St. Lucy is about the best known. So I figured I’d just graft onto the Virgin from one day earlier. I’ll stick with La Jefa.